Registration for halow250 Super 8 is fully booked! Sign up for 2020 today. Push yourself to achieve something amazing and take part in the halow250 2019! Last years Magnificent Seven halow250 raised an outstanding £76,000! All thanks to the cyclists, who pushed themselves to the limits through heat and hills to cover 250 miles in just three days through the Surrey Hills and the South Downs, before crossing the channel to France. After months of intense training, we had a record-breaking amount of people wanting to take on the halow250 this year- and not just our usual spandex-clad cycling obsessives either! From families, carers, sponsors, local companies and halow’s young people, the halow250 really is something everyone can get in to. The atmosphere as everyone crossed the start line in Putney was incredible, only stopping to spend the night on the ferry to France. The second day didn’t get any easier, as our ride took the scenic route from St Malo to Caen, that’s a whopping 117 miles in one day! Stopping for the odd snack and leg-stretch, our cyclists couldn’t wait to get back on the road to see more of France’s most beautiful sites. ‘The Magnificent Seven lived up to its title and in many ways, was the best yet. We couldn’t do it without having a ‘magnificent’ team supporting before and during the ride, we’ll be back on the 3rd May 2019!’- George and Mark, GM Recruitment. Whilst the riders were up and down the French hills, a group of young people were cycling 250 miles a little closer to home! Outside Waitrose in Guildford, we held a static 250 as an opportunity for everyone in the community to get involved. It’s fantastic what you can do with a couple of exercise bikes outside a supermarket, so many people got involved and loved learning more about halow and how we help young people with learning disabilities. Hopefully, we can see some of them on the less-static version next year! 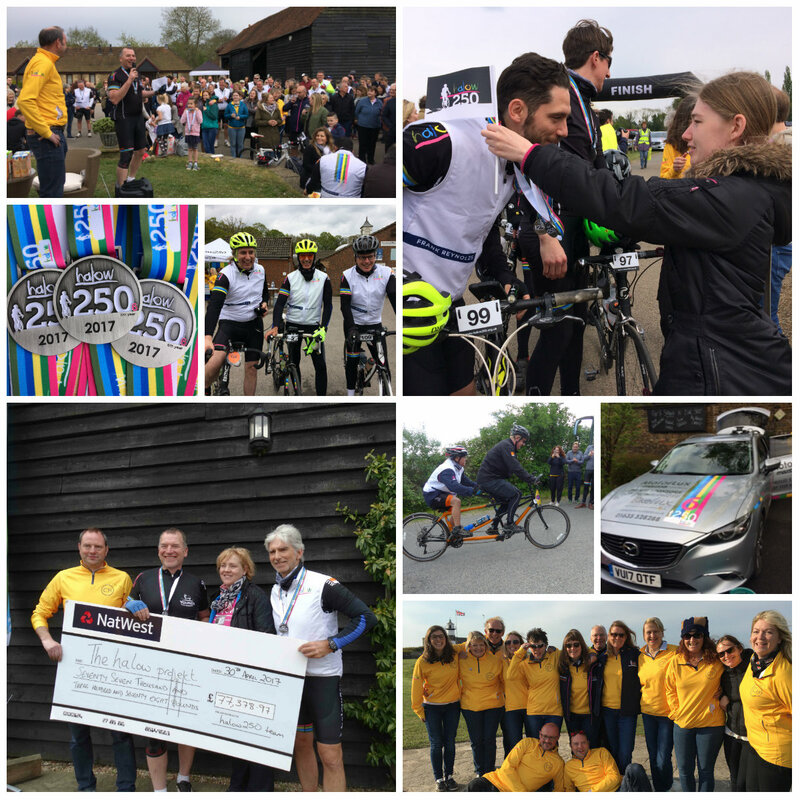 We finished the weekend with a welcome home party at Clock Barn, Godalming, where our young people had the chance to welcome over 100 riders to thank them for their effort. Everyone had an amazing amount of energy considering the strenuous weekend they had! The enthusiasm from everyone was overwhelming as the young people at halow presented the cheque and handed out some well-earned medals. Everyone had so much fun and loved being able to participate in our biggest fundraiser of the year. Sign up now for the halow250 Super 8. which will take place between the 3rd-5th May 2019. Visit www.halow250.org.uk, or get in touch at fundraising@halowproject.org.uk 01483 447 960.